At least Craig MacTavish was honest Monday when he fired Dallas Eakins. Eakins is out because the Oilers went 36-63-14 under him, because they won one of their last 16 games, because Sunday’s 2-0 loss to the New York Rangers was a joke. The Oilers were a laughingstock. Literally. Listen to Rangers goaltender Henrik Lundqvist cackle when asked if he had to make any signature saves in the shutout. “Do you remember any one?” he asked. Maybe Eakins was a problem. He was too arrogant when he came up from the minors as The Next Big Thing. He made improvements in some areas (shots against) but not others (special teams). Too often he looked defeated, and so did his players. The Oilers ranked last not just in points, but also in body language. But Eakins was not the problem. Abysmal save and shooting percentages made the Oilers look even worse than they actually were, and they had holes. The problem was the roster and everyone responsible for it: the scouts, the general manager(s), the president and ultimately the owner. And that means the problem still has not been solved. Owner Daryl Katz grew up rooting for the Oilers when they were a dynasty, and he has put too much trust in one of his old heroes, Kevin Lowe, who won six Stanley Cups as a player but has won only draft lotteries as a president. Lowe coached the Oilers in 1999-2000. He served as GM from 2000-08 until he became president of hockey operations. Since then, they have finished 21st, 30th, 30th, 29th, 24th and 28th in the 30-team NHL. They ranked 30th again Monday. This is in an era of parity. The only way this could be worse is if the Oilers contracted the mumps. The Oilers have drafted in the top 10 seven times in eight years – first overall three times – yet have a questionable core. They have rushed youngsters to the NHL, giving them jobs and large second contracts before they have earned them. They have surrounded them with poor supporting casts. They have immersed them in a losing culture. Lowe stuck with GM Steve Tambellini too long. The Oilers went through coach after coach: MacTavish, Pat Quinn, Tom Renney, Ralph Krueger. When Lowe finally fired Tambellini in April 2013, he turned to old friend MacTavish instead of conducting a wide-ranging search. MacTavish ended up firing Krueger by phone, even though Krueger only had the chance to coach the lockout-shortened 2012-13 season and seemed to make some progress. MacTavish did it because he had to have Eakins. Then he gave Eakins a team with poor goaltending, poor defense and poor center depth. Left winger Taylor Hall, the first pick in the 2010 draft, the Oilers’ best player, sounded discouraged before this season even started when asked what Edmonton needed to do to take the next step. The Oilers are 1-15-4 against the West. They’re in the conference basement by five points. They can’t keep up with the rest, let alone the best. MacTavish supported Eakins and did not want to fire him, but the losing, losing, losing left him no choice. Now he will be back behind the bench for a short time to transition to Todd Nelson, who is coming up from the minors and will be the interim coach for the rest of the season – the seventh coach of the Lowe era. At least MacTavish said: “There’s blood all over my hands in this, too.” At least he said: “I’m not here to absolve myself of accountability for the situation we’re in, nor am I here to solely blame Dallas for the job he did.” It’s about time someone from Oilers leadership accepted some responsibility for this mess. Where’s Lowe? Where’s Katz? What’s next? MacTavish won’t talk about tanking. “It’s not in anybody’s DNA in professional sports to talk about that or to try and do that,” he told reporters. “We’re very much trying to turn the performance level of the hockey club around, and certainly our draft status had no bearing on this decision.” But let’s be honest: The season is over for the Oilers. They aren’t making the playoffs. All that matters now is preparing for the future once again. MacTavish won’t talk about breaking up his core. “I don’t want to answer that question till I get a hands-on understanding of exactly what’s happening in there,” he said. “I’ve got a pretty good understanding of that, but I want to have ample opportunity to have eyeball-to-eyeball conversations with the core group that we have in hopes that we can move this thing forward before I’m willing to do anything.” But let’s be honest again: He shouldn’t do anything. Lowe needs to go. Now. The Oilers hired Bob Nicholson from Hockey Canada to be the vice chair of the Oilers Entertainment Group. 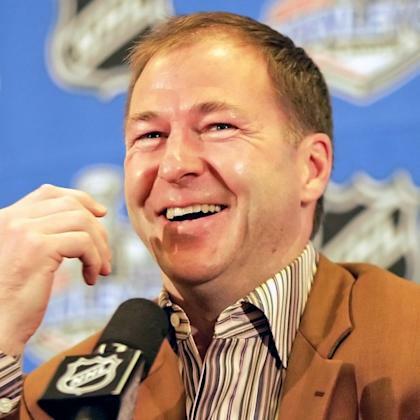 He needs to take over hockey ops and do what Lowe did not last time: conduct a wide-ranging search for a new GM. The new GM should evaluate the roster, the coaching staff, the scouting staff, everyone and everything, and he should have as many assets and as much flexibility as possible. He should set the next course. MacTavish has had only 19 months. Normally, that’s not enough to judge a GM. But in this case it’s justified. MacTavish has fired coaches after only 48 games and 113 games. If anyone should understand, it’s him.